ALA, in partnership with Citizen Film and the National Writing Project, selected 50 US public libraries to take part in “American Creed: Community Conversations,” a grant program that invited audiences to consider what America’s ideals and identity ought to be through screenings of, and conversations about, the PBS documentary American Creed. The Nyack Library was selected to host community screenings of the film, complemented by additional programming. Join us for a Writing Celebration! After viewing excerpts from the PBS documentary American Creed, we will celebrate outstanding youth and adult writing sparked by the film, which features former Secretary of State Condoleezza Rice, historian David Kennedy, and a diverse group of Americans exploring whether a unifying set of beliefs, an American creed, can prove more powerful than the issues that divide us. Facilitators: Mary Sawyer, SUNY New Paltz and Jacqueline Hesse, Newburgh Free Academy, P-TECH. -What is your American creed? ​-How does your family and community history connect to your American creed? -How do words symbols or rituals express the American creed? -How do diverse Americans understand the American creed? -How can you express your American creed through action? 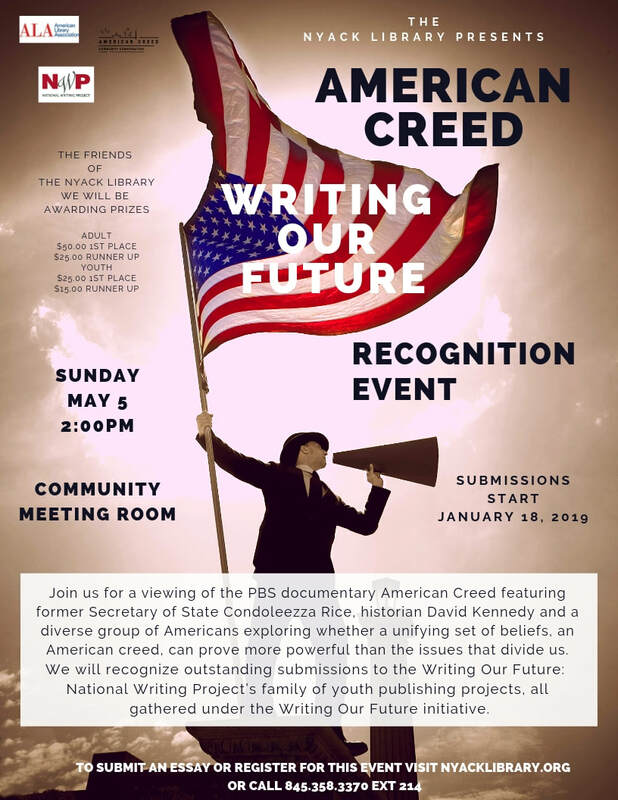 Submissions for Nyack Library’s American Creed Writing Celebration must be submitted by April 22, 2019. Youth 11+ - 18 with Nyack Library submit to the Hudson Valley Writing Project/Nyack Library Group Code 678620. Outstanding submissions will be recognized at the event. ​You must first Sign Up at https://writingourfuture.nwp.org/americancreed/register. Once you Sign Up you can then come back and Log In when needed. *Songs may be subject to change. 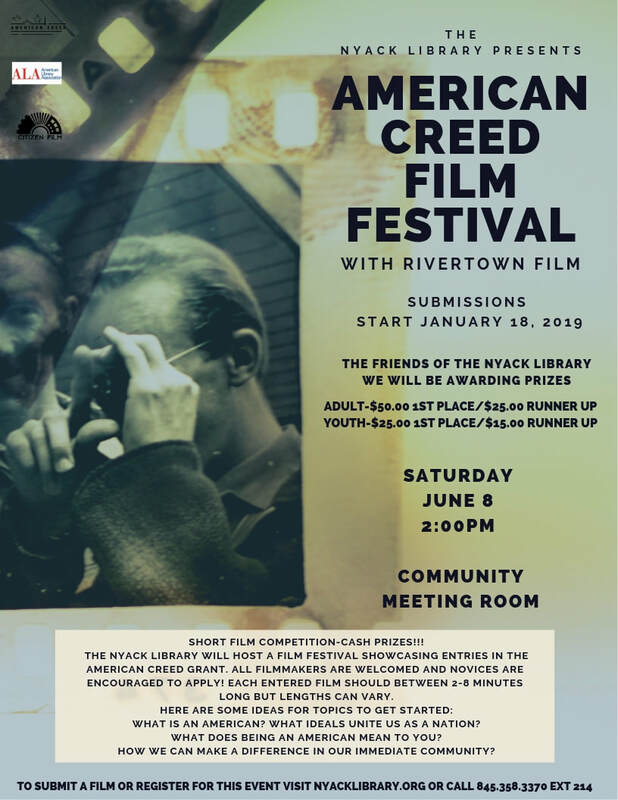 The Nyack Library will host a film festival showcasing entries in the American Creed Grant. All filmmakers are welcomed and novices are encouraged to apply! Each entered film should between 2-8 minutes long but lengths can vary. What ideals unite us as a nation? What does being an American mean to you? How we can make a difference in our immediate community? Open to anyone in the Hudson Valley interested in participating. One must understand their history before moving on to the future. 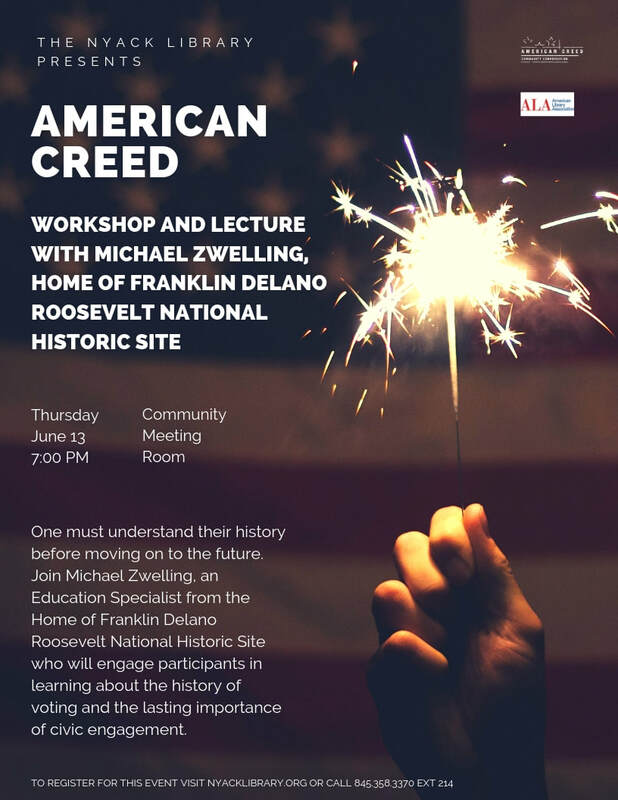 Join Michael Zwelling, an Education Specialist from the Home of Franklin Delano Roosevelt National Historic Site who will engage participants in learning about the history of voting and the lasting importance of civic engagement. Civic Saturdays are meant to help us practice being together as citizens; that is, as those willing to show up in public life together. 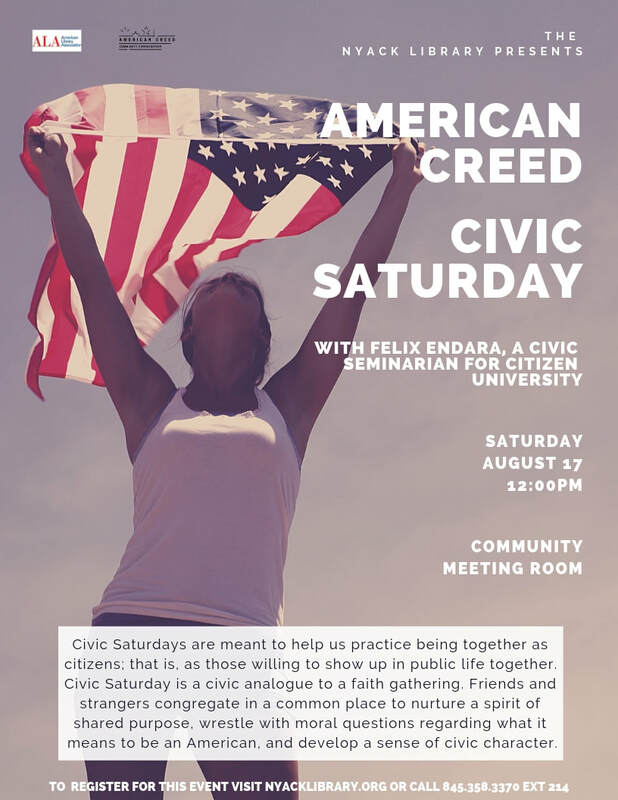 Civic Saturday is a civic analogue to a faith gathering. Friends and strangers congregate in a common place to nurture a spirit of shared purpose, wrestle with moral questions regarding what it means to be an American, and develop a sense of civic character. ​The event will be hosted by Felix Endara, a civic seminarian from Citizen University. Born in Ecuador, Felix Endara is a queer transgender New York-based independent filmmaker, programmer, and arts administrator whose films have screened at festivals including Berlin, Frameline, Outfest, NewFest, DOC NYC, and Mill Valley. From 2008 to 2012, he programmed Arts Engine’s documentary screening series DocuClub, which he toured to Mexico City and Silver Spring, Maryland. The Rockland County Choral Society*, "one of the oldest continuously performing arts organizations in Rockland County offering a full spectrum of beautiful choral music" under the direction of Russell Wagoner, will kick off the American Creed Documentary screening by singing "The Star Spangled Banner." The idea for American Creed grew out of conversations between two Stanford University professors: political scientist and former Secretary of State Condoleezza Rice, and David M. Kennedy, who became a historian in large part to determine whether the United States has a “national character” — what defines it and how it changes over time. Who are the “we” in “We the People of the United States…”? What does being a “citizen” mean? What does productive, imaginative and engaged citizenship look like at this time in our history? How do economic booms and busts shape ideals and disconnect from ideals? What happens to the idea of a shared American creed when social mobility declines along with trust in American institutions? Where are we headed as citizens, and as a nation? We hope that the stories in American Creed — which speak to our dilemmas, yet offer hope that our shared ideals can prove more powerful than our differences — will engage viewers in a bold conversation about what it will take to uphold American democracy. 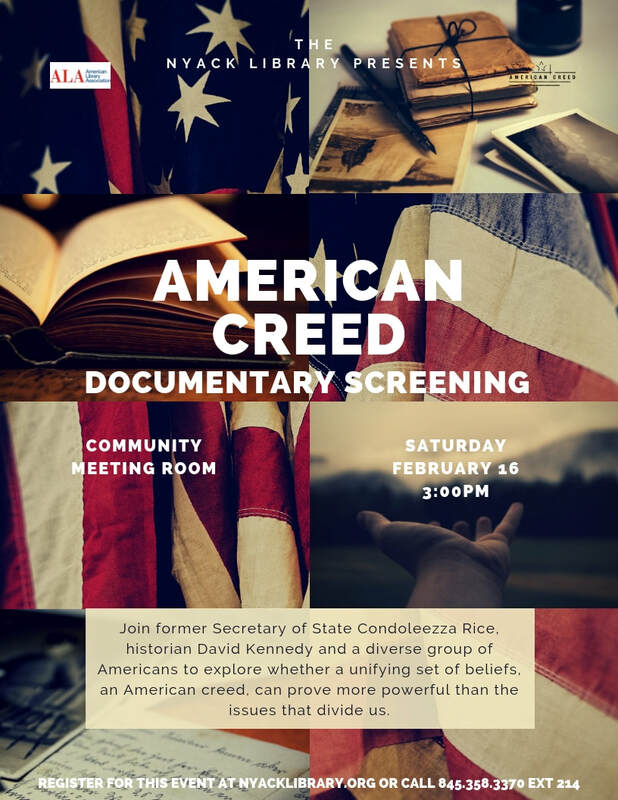 The film American Creed looks at the “big picture” civic needs of America, through this program, participants will learn more about civic duty at the local level. 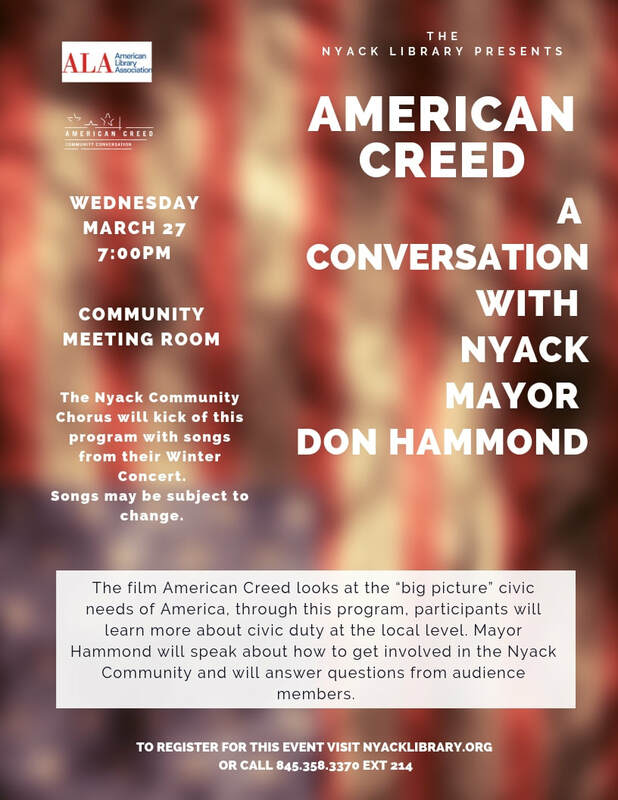 Mayor Hammond will speak about how to get involved in the Nyack Community and will answer questions from audience members. The Nyack Community Chorus*, under the direction of Dru Pluhowski, aims to create music that “fosters community, stirs the soul, and ignites joy for all.” The Chorus will be singing from their Winter Concert among these “Make Them Hear You”& “Give Me Your Tired Your Poor” to complement American Creed’s Conversation with Nyack’s Mayor Don Hammond. American Creed: Community Conversations is a project of Citizen Film in partnership with the American Library Association and the National Writing Project, with support from the National Endowment for the Humanities.